How to repair concrete stairs? Damaged steps are more than an eyesore, they can be dangerous. Whether a home or a commercial property, fixing damaged steps is a priority task that needs to be done immediately. Question is, do you repair or replace? If damage is extensive, it is probably better to call a pro and replace the stairs. If, however, the major portion of the steps are sound, a repair may do the trick. The tools you will need to fix your concrete stairs are: drill with masonry bit, hammer, wire brush, concrete trowel, scrap wood or boards, latex bonding product, concrete patching material and something to mix it in, re-rod or re-bar, an old paint brush and some heavy blocks, adhesive tape, straps or clamps to hold boards in place. Start by cleaning off the area completely, use the wire brush. Drill a hole, or holes, into the damaged areas to fit in re-rod to act as a connector, cut and fit the metal rod and drive it in about half way, remove all debris and dust from drilling, set up a mold for the step with concrete blocks or scrap wood to create edges of steps. Now, mix your concrete patching and apply the adhesive agent to the area, take care to mix concrete to the right consistency. Use a trowel to apply the concrete to the damaged areas. Use an old brush to stipple the finish to match the original concrete. When done application, make sure forms are solid, cover the area with plastic if it will be exposed to any rain or moisture. Remove the plastic after twenty four hours and leave the forms in place for about a week while the concrete cures. Once you remove the forms, use the wire brush to neaten up the finish, and the project is complete. 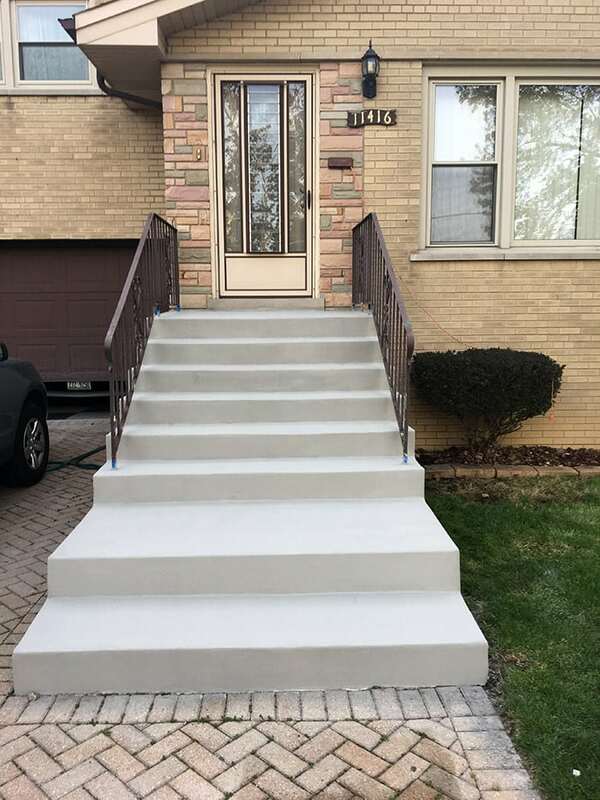 How to take care of concrete stairs? In most cases concrete is a durable, long lasting product without maintenance. So it often raises eyebrows when the subject of maintaining concrete is brought up. Properly maintaining concrete, however, can greatly extend the life of the concrete and the beauty of the concrete: plain concrete can look clean and bright-instead of oil stained and grimy. It can look the same after years of enjoyment as it did when it was brand new-instead of faded, oil stained, and dirty. Properly maintaining the concrete protects your investment in concrete. 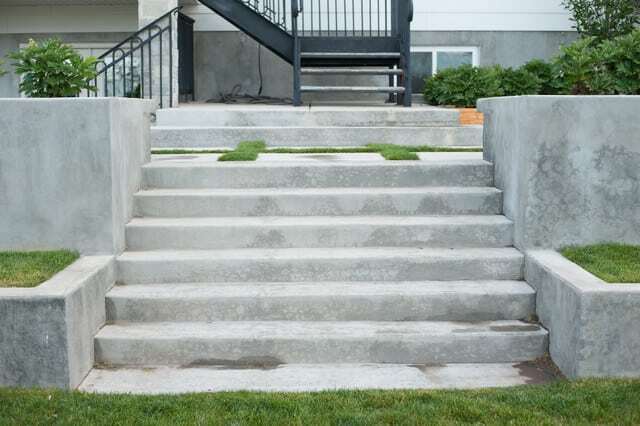 In what way you can take care of your concrete stairs ? Firstly, you need to sweap the stair to have a clean surface. Then, mix one part of hot water and two parts of dish soap and pour the solution over the stains on your stairs. Then let the solution set for 10-15 minutes. But make sure that it does not dry. Now, you need to scrub the stain with stiff bristle brush. Do it until the stains are completely removed. At the end, rinse it with hot water. You may need to do it two to three times. Remove everything from the stairs and sweep the dirt. Then, mix one part of hot water to one part of oxygenated bleach and mix them together. Alternatively, you can use a specially formulated concrete cleaner instead of the oxygenated bleach and water. Now, you have to spray the steps with the solution and let it set for 20 to 30 minutes. Then scrub the steps with a long handled brush. Finally, rinse the steps with hot water. From the top of the stairs, pour the water down the steps to rinse them clean. Rinse the steps until all of the soap residue, dirt, and grime are removed.